So I have been a bit busy getting 36"x36" paintings ready for a little art show at my church. Which means my comfortable "lead" on getting 52 portraits done in 52 weeks has been whittled down to about a week. Oops. 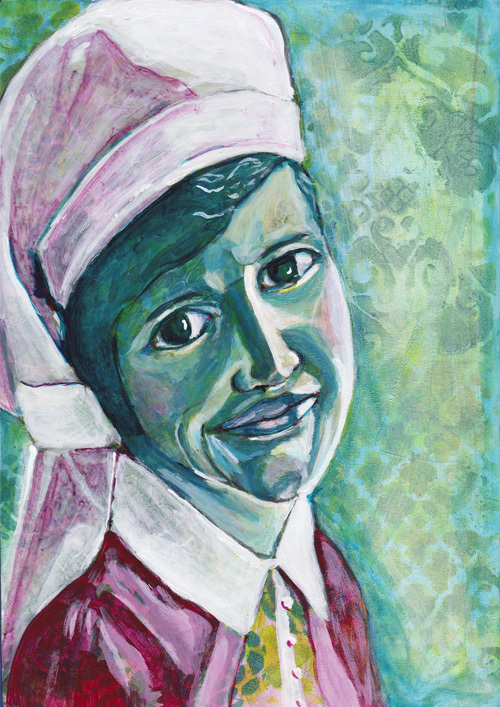 On my "list of portraits" to paint, I included "Australian WWI Nurse". This was part inspired by a WWI mini-series about nursing that came out in 2014 called "ANZAC Girls" that I watched, oh, some time in the last six months, I think. I'm on to "iZombie" now, god help us all. Also, I had listened to a "Talking with Painters" podcast where Maria Stoljar interviewed artists who went to Gallipolli, Turkey and other WWI sites to paint them for the 100th anniversary of the end of the war. It was really moving stuff. This piece is also inspired by Effy Wild's Lifebook 2018 lesson that came out last week. I love Effy's lessons and I was really intrigued by her glazing method for the face. Did I 100% follow it? Well, no ... I did kind of fall back into my portrait-painting habits. The background prep started out similarly, which if you are a current LifeBooker you can tell in the final image. I had some leftover turquoise paint from the aforementioned big 36"x36" canvas which got smooshed straight onto the page, and I was going to start from there, but Effy used stencils and I thought, that sounds like fun. (Although I didn't use them the way she did.) And it was also a most excellent way of putting off starting the portrait itself. I also had leftover glazes from the big 36"x36" so this seemed like a good one to try, although one of my glazes was so transparent it barely registered on the page, so I had to go in with some fresh color. In this one I used the following Golden fluid acrylics: Turquoise, Quidacridone Violet, Quidacridone Nickel Azo Gold and Titanium White. The glazes had been made by mixing soft gel medium, iridescent medium and pearlescent medium -- which I initially had in separate piles but just combined together for the purpose of needing three colors to glaze with. Using a reference photo of an Aussie nurse from WWI, which is in the public domain, I drew the main bits in with a Lyra pencil (which was both a help and a hindrance as it turned out) and then sat listening to "Talking with Painters" for over an hour and painted and painted. So no progress shots for you. Here she is. I don't know why I decided to do her nurse's veil. It would have been much easier to turn it into hair, but I kind of like that it's loosey goosey as is her uniform. Her hair, however, is much neater than in the original photo.